The Israeli disengagement from Gaza (Hebrew: תוכנית ההתנתקות‎, Tokhnit HaHitnatkut; in the Disengagement Plan Implementation Law), also known as "Gaza expulsion" and "Hitnatkut", was the withdrawal of the Israeli army from Gaza, and the dismantling of all Israeli settlements in the Gaza Strip in 2005. Four small settlements in the northern West Bank were also evacuated. The disengagement was proposed in 2003 by Prime Minister Ariel Sharon, adopted by the Government in June 2004, approved by the Knesset in February 2005 and enacted in August 2005. Israeli citizens who refused to accept government compensation packages and voluntarily vacate their homes prior to the August 15, 2005 deadline, were evicted by Israeli security forces over a period of several days. The eviction of all residents, demolition of the residential buildings and evacuation of associated security personnel from the Gaza Strip was completed by September 12, 2005. The eviction and dismantlement of the four settlements in the northern West Bank was completed ten days later. A total of 8,000 Jewish settlers from all 21 settlements in the Gaza Strip were relocated. The average settler received compensation of over U.S $200,000. Post-disengagement, Israel continued to exercise control over the external perimeter of Gaza, including seaports, air space, and the passage of people and goods. In his book Sharon: The Life of a Leader, Israeli Prime Minister Ariel Sharon's son Gilad wrote that he gave his father the idea of the disengagement. Sharon had originally dubbed his unilateral disengagement plan, the "separation plan" or Tokhnit HaHafrada before realizing that, "separation sounded bad, particularly in English, because it evoked apartheid." Sharon suggested his disengagement plan for the first time on December 18, 2003 at the Fourth Herzliya Conference. In his address to the Conference, Sharon stated that ″settlements which will be relocated are those which will not be included in the territory of the State of Israel in the framework of any possible future permanent agreement. At the same time, in the framework of the Disengagement Plan, Israel will strengthen its control over those same areas in the Land of Israel which will constitute an inseparable part of the State of Israel in any future agreement.″ It was at this time that he began to use the word "occupation". Bernard Avishai states that the Gaza withdrawal was designed to obviate rather than facilitate peace negotiations: Sharon enivisaged at the same time annexing Jerusalem, the Jordan Valley, and the major settlements like Ma'ale Adumim and Ariel which he had in the meantime developed, and thereby isolate Palestinians on the West Bank in territory that constituted less than half of what existed beyond the Green Line . "The significance of the disengagement plan is the freezing of the peace process, and when you freeze that process, you prevent the establishment of a Palestinian state, and you prevent a discussion on the refugees, the borders and Jerusalem. Effectively, this whole package called the Palestinian state, with all that it entails, has been removed indefinitely from our agenda. And all this with authority and permission. All with a presidential blessing and the ratification of both houses of Congress. That is exactly what happened. You know, the term `peace process' is a bundle of concepts and commitments. The peace process is the establishment of a Palestinian state with all the security risks that entails. The peace process is the evacuation of settlements, it's the return of refugees, it's the partition of Jerusalem. And all that has now been frozen.... what I effectively agreed to with the Americans was that part of the settlements would not be dealt with at all, and the rest will not be dealt with until the Palestinians turn into Finns. That is the significance of what we did." Sharon formally announced the plan in his April 14, 2004 letter to U.S. President George W. Bush, stating that "there exists no Palestinian partner with whom to advance peacefully toward a settlement". On June 6, 2004, Sharon's government approved an amended disengagement plan, but with the reservation that the dismantling of each settlement should be voted separately. On October 11, at the opening of the Knesset winter session, Sharon outlined his plan to start legislation for the disengagement in the beginning of November and on October 26, the Knesset gave its preliminary approval. On February 16, 2005, the Knesset finalized and approved the plan. Failing to gain public support from senior ministers, Sharon agreed that the Likud party would hold a referendum on the plan in advance of a vote by the Israeli Cabinet. 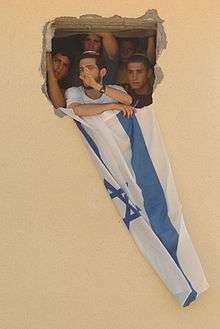 The referendum was held on May 2, 2004 and ended with 65% of the voters against the disengagement plan, despite some polls showing approximately 55% of Likud members supporting the plan before the referendum. Commentators and the press described the rejection of the plan as a blow to Sharon. Sharon himself announced that he accepted the Likud referendum results and would take time to consider his steps. He ordered Minister of Defense Shaul Mofaz to create an amended plan which Likud voters could accept. On June 6, 2004, Sharon's government approved an amended disengagement plan, but with the reservation that the dismantling of each settlement should be voted separately. The plan was approved with a 14-7 majority but only after the National Union ministers and cabinet members Avigdor Liberman and Binyamin Elon were dismissed from the cabinet, and a compromise offer by Likud's cabinet member Tzipi Livni was achieved. Following the approval of the plan, it was decided to close the Erez industrial zone and move its factories to cities and towns in Israel such as Ashkelon, Dimona, Yeruham, and Sderot. Ehud Olmert, then the Minister of Industry, Trade, and Labor, stated that the closing was part of Israel's plan to withdraw from the Gaza Strip. As a result of the passing of the plan (in principle), two National Religious Party (NRP) ministers, Effi Eitam and Yitzhak Levi, resigned, leaving the government with a minority in the Knesset. Later, the entire faction quit after their calls to hold a national referendum were ignored. Sharon's pushing through this plan alienated many of his supporters on the right and garnered him unusual support from the left-wing in Israel. The right believes that Sharon ignored the mandate he had been elected on, and instead adopted the platform of his Labor opponent, Amram Mitzna, who was overwhelmingly defeated when he campaigned on a disengagement plan of far smaller magnitude. At that time, Sharon referred to Gaza communities such as Netzarim as "no different than Tel Aviv", and said that they are of such strategic value that "the fate of Netzarim is the fate of Tel Aviv." Many on both sides remained skeptical of his will to carry out a withdrawal beyond Gaza and the northern West Bank. Sharon had a majority for the plan in the government but not within his own party. This forced him to seek a National Unity government, which was established in January 2005. Opponents of the plan, and some ministers, such as Benjamin Netanyahu and former minister Natan Sharansky, called on Sharon to hold a national referendum to prove that he had a mandate, which he refused to do. On September 14, the Israeli cabinet approved, by a 9–1 majority, plans to compensate settlers who left the Gaza Strip, with only the NRP's Zevulun Orlev opposing. The government's plan for compensation used a formula that based actual amounts on location, house size, and number of family members among other factors. Most families were expected to receive between U.S.$200,000 and 300,000. On October 11, at the opening of the Knesset winter session, Sharon outlined his plan to start legislation for the disengagement in the beginning of November. In a symbolic act, the Knesset voted 53–44 against Sharon's address: Labour voted against, while the National Religious Party and ten members of Likud refused to support Sharon in the vote. On October 26, the Knesset gave preliminary approval for the plan with 67 for, 45 against, 7 abstentions, and 1 member absent. Netanyahu and three other cabinet ministers from Sharon's ruling Likud government threatened to resign unless Sharon agreed to hold a national referendum on the plan within fourteen days. On November 9, Netanyahu withdrew his resignation threat, saying "In this new situation [the death of Yasser Arafat], I decided to stay in the government". Following the vote fourteen days earlier, and Sharon's subsequent refusal to budge on the referendum issue, the three other cabinet ministers from the Likud party backed down from their threat within days. On December 30, Sharon sealed a deal with the Labor Party to form a coalition, with Shimon Peres becoming Vice Premier, restoring the government's majority in the Knesset. On February 16, 2005, the Knesset finalized and approved the plan with 59 in favor, 40 opposed, 5 abstaining. A proposed amendment to submit the plan to a referendum was rejected, 29–72. On March 17, the Southern Command of the Israel Defense Forces issued a military order prohibiting Israeli citizens not living in the Gaza Strip settlements from taking up residence there. On March 28, the Knesset again rejected a bill to delay the implementation of the disengagement plan by a vote of 72 to 39. The bill was introduced by a group of Likud MKs who wanted to force a referendum on the issue. On August 7, Netanyahu resigned just prior to the cabinet ratification of the first phase of the disengagement plan by a vote of 17 to 5. Netanyahu blamed the Israeli government for moving "blindly along" with the disengagement by not taking into account the expected upsurge in terrorism. On August 10, in his first speech before the Knesset following his resignation, Netanyahu spoke of the necessity for Knesset members to oppose the proposed disengagement. "Only we in the Knesset are able to stop this evil. Everything that the Knesset has decided, it is also capable of changing. I am calling on all those who grasp the danger: Gather strength and do the right thing. I don't know if the entire move can be stopped, but it still might be stopped in its initial stages. [Don't] give [the Palestinians] guns, don't give them rockets, don't give them a sea port, and don't give them a huge base for terror." On August 15, Sharon said that, while he had hoped Israel could keep the Gaza settlements forever, reality simply intervened. "It is out of strength and not weakness that we are taking this step", repeating his argument that the disengagement plan has given Israel the diplomatic initiative. On August 31, the Knesset voted to withdraw from the Gaza-Egypt border and to allow Egyptian deployment of border police along the demilitarized Egyptian side of the border, revising the previously stated intent to maintain Israeli control of the border. Hermesh and Mevo Dotan in the northwestern West Bank were included in the original disengagement plans, but were dropped from the plans in March. Sharon said that his plan was designed to improve Israel's security and international status in the absence of political negotiations to end the Israeli-Palestinian conflict. 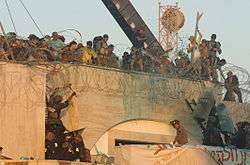 About nine thousand Israeli residents within Gaza were instructed to leave the area or face eviction by the night of Tuesday August 16, 2005. Under the Revised Disengagement Plan adopted on June 6, 2004, the IDF was to have remained on the Gaza-Egypt border and could have engaged in further house demolitions to widen a 'buffer zone' there (Art 6). However, Israel later decided to leave the border area, which is now controlled by Egypt and the Palestinians, through the PNA. Israel will continue to control Gaza's coastline and airspace and reserves the right to undertake military operations when necessary. (Art 3.1). Egypt will control Gaza's Egyptian border. Israel will continue to provide Gaza with water, communication, electricity, and sewage networks. For the first time since 1967, Palestinian authorities would have complete control over exits and entrances to their territory. That both parties to the agreement, Israel and Palestinians, would upgrade and expand crossings to facilitate the movement of people and goods between Israel, Gaza and the West Bank. Palestinians would be allowed the use of bus and truck convoys to move between Gaza and the West Bank. Obstacles to movement in the West bank would be lifted. A Palestinian seaport was to be constructed on the Gaza littoral. A Palestinian airport was considered important by both sides. and the United States was encouraging Israel to entertain the idea that construction to that end was to be resumed. Because the Palestinian Authority in Gaza did not believe it had sufficient control of the area at this time, foreign observers such as the International Committee of the Red Cross, Human Rights Watch and various legal experts have argued that the disengagement will not end Israel's legal responsibility as an occupying power in Gaza. Israel and Egypt have concluded an agreement under which Egypt can increase the number of police on its side of the border, while the IDF evacuates the Gazan side. The text of the agreement is not yet public. Residents protest during the forced evacuation of the Israeli community Kfar Darom. August 18, 2005. The disengagement began with Operation "Yad l'Achim" (Hebrew: מבצע יד לאחים, “Giving brothers a hand"). The aim of the operation was to give the Gush Katif settlers the option to leave voluntarily. IDF soldiers helped the settlers who chose to do so by packing their belongings and carrying them. During the operation, soldiers went into settlers' homes and presented them with removal decrees. In addition, the IDF arranged crews of social nurses, psychologists, and support to youths. On April 8, 2005, Defense Minister Shaul Mofaz said that Israel should consider not demolishing the evacuated buildings in the Gaza Strip, with the exception of synagogues (due to fears of their potential desecration, which eventually did occur), since it would be more costly and time consuming. This contrasted with the original plan by the Prime Minister to demolish all vacated buildings. On May 9, the beginning of the evacuation of settlements was officially postponed from July 20 until August 15, so as to not coincide with the Jewish period of The Three Weeks and the fast of Tisha B'Av, traditionally marking grief and destruction. On July 13, Sharon signed the closure order of Gush Katif, making the area a closed military zone. From that point on, only residents who presented Israeli ID cards with their registered address in Gush Katif were permitted to enter. Permits for 24–48 hours were given to select visitors for a few weeks before the entire area was completely sealed off to non-residents. Despite this ban, opponents of the disengagement managed to sneak in by foot through fields and bare soil. Estimates range from a few hundred to a few thousand people for those there illegally at that time. At one point, Sharon contemplated deploying border police (Magav) forces to remove non-residents, but decided against it, as the manpower requirement would have been too great. At midnight between August 14 and 15, the Kissufim crossing was shut down, and the Gaza Strip became officially closed for entrance by Israelis. The evacuation by agreement continued after midnight of the August 17 for settlers who requested a time extension for packing their things. The Gush Katif Municipal Council threatened to unilaterally declare independence, citing the Gaza Strip's internationally disputed status and Halacha as a foundation. Meanwhile, on August 14, Aryeh Yitzhaki proclaimed the independence of Shirat HaYam as "The Independent Jewish Authority in Gaza Beach", and submitted appeals for recognition to the United Nations and Red Cross. On August 15, the evacuation commenced under the orders of Maj. Gen. Dan Harel of the Southern Command. At 8 a.m., a convoy of security forces entered Neve Dekalim and began evacuating residents. Although many settlers chose to leave peacefully, others were forcibly evicted, while some attempted to block buses and clashed with security forces. The evacuations of six settlements then commenced as 14,000 Israeli soldiers and police officers forcibly evicted settlers and "mistanenim" (infiltrators). They went house to house, ordering settlers to leave and breaking down the doors of those who did not. There were scenes of troops dragging screaming and sobbing families from houses and synagogues, but with less violence than expected. Some of the soldiers were also observed sobbing, and there were instances of soldiers joining settlers in prayer before evicting them. Some settlers lit their homes on fire as they evacuated so as to leave the Palestinians nothing. Settlers blocked roads, lit fires, and pleaded with soldiers to disobey orders. One West Bank settler set herself on fire in front of a Gaza checkpoint, and in Neve Dekalim, a group of fifteen American Orthodox Jews barricaded themselves in a basement and threatened to light themselves on fire. Kfar Darom was next evacuated. Residents and their supporters strung up barbed wire fences around the area, and security forces cut their way in. Some 300 settlers barricaded themselves in the local synagogue, while another group barricaded themselves on the roof with barbed wire, and pelted security forces with various objects. Police removed them by force after negotiations failed, and there were injuries to both settlers and officers. On August 17, the settlement of Morag was evacuated by 200 police officers. On August 18, Shirat HaYam was evacuated by military and police forces, after infiltrators had been removed and the settlement's speaker system was disabled after settlers used it to call on troops to disobey orders. Youth placed obstacles made of flammable materials and torched tires and garbage dumpsters. Fires spread to Palestinian areas, and IDF bulldozers were deployed to put them out. A number of people also barricaded themselves in the synagogue and public buildings and on a deserted rooftop. Aryeh Yitzhaki defended his home with an M16 rifle, and dozens of settlers barricaded themselves inside or on the roof of his home, with at least four of those on the rooftop being armed. A brief stand-off with security forces ensued, and snipers were deployed after Yitzhaki threatened to fire at troops. Security forces stormed the rooftop and arrested settlers without any violence. IDF and police forces evacuated the home after Yitzhaki surrendered weapons and ammunition belonging to his group, but were met with bags of paint and whitewash thrown by settlers, and Yitzhaki's wife and another right-wing activist initially refused to evacuate and lay on the ground holding their infants. Bedouin citizens of Israel from the village of Dahaniya, situated in the no-man's land on the Israel-Gaza Strip border, were evacuated and resettled in Arad. The village had a long history of cooperation with Israel, and the residents, who were viewed in Gaza as traitors, had asked to be evacuated due to security concerns. On August 19, The Guardian reported that some settlers had their children leave their homes with their hands up, or wearing a Star of David badge, to associate the actions of Israel with Nazi Germany and the Holocaust. On August 22, Netzarim was evacuated by the Israeli military. This officially marked the end of the 38-year-long presence of Israeli settlers in the Gaza Strip, though the official handover was planned for several weeks later. The evacuation of the settlers was completed by 22 August, after which demolition crews razed 2,800 houses, community buildings and 26 synagogues. Two synagogues, whose construction allowed for them to be taken apart and reassembled, were dismantled and rebuilt in Israel. The demolition of the homes was completed on September 1, while the Shirat HaYam hotel was demolished later. On August 28, the IDF began dismantling Gush Katif's 48-grave cemetery. All of the bodies were removed by special teams of soldiers supervised by the Military Rabbinate and reburied in locations of their families' choosing. In accordance with Jewish law, all soil touching the remains was also transferred, and the dead were given second funerals, with the families observing a one-day mourning period. All coffins were draped in the Israeli flag on the way to reburial. The transfer was completed on September 1. The IDF also began withdrawing its forces in the Gaza Strip, and had withdrawn 95% of its military equipment by September 1. On September 7, the IDF announced that it planned to advance its full withdrawal from the Gaza Strip to September 12, pending cabinet approval. It was also announced that in the area evacuated in the West Bank the IDF planned to transfer all control (excluding building permits and anti-terrorism) to the PNA - the area will remain "Area C" (full Israeli control) de jure, but "Area A" (full PNA control) de facto. The Jerusalem High Court, in response to a settlers' petition to block the government's destruction of the synagogues, gave the go-ahead to the Israeli government. Sharon decided not to proceed with their demolition, however. On September 11, the Israeli cabinet revised an earlier decision to destroy the synagogues of the settlements. The Palestinian Authority protested Israel's decision, arguing that it would rather Israel dismantle the synagogues. On September 11, a ceremony was held when the last Israeli flag was lowered in the IDF's Gaza Strip divisional headquarters. All remaining IDF forces left the Gaza Strip in the following hours. The last soldier left the strip, and the Kissufim gate was closed in the early morning of September 12. This completed the Israeli pullout from the Gaza Strip. However, an official handover ceremony was cancelled after the Palestinian Authority boycotted it in response to Israel's decision not to demolish the synagogues. All of the greenhouses in the settlements were supposed to be intact after the Economic Cooperation Foundation raised $14 million to buy the greenhouses for the Palestinian Authority, although about half of them were previously demolished by their own owners before being evacuated for lack of the agreed payment. On September 20, the IDF temporarily entered the northern Gaza Strip, constructing a buffer zone parallel to the border near Beit Hanoun before pulling out. Residents of Elei Sinai camping in Yad Mordechai, just over the border from their former homes. On September 22, the IDF finished evacuating the four settlements in the northern West Bank. While the residents of Ganim and Kadim, mostly middle-class seculars, had long since left their homes, several families and about 2,000 outsiders tried to prevent the evacuation of Sa-Nur and Homesh, which had a larger percent of observant population. Following negotiations, the evacuation was completed relatively peacefully. The settlements were subsequently razed, with 270 homes being bulldozed. In Sa-Nur, the synagogue was left intact, but was buried under mounds of sand by bulldozers to prevent its destruction by the Palestinians. During the pullout, hundreds of people were arrested for rioting, and criminal charges were filed against 482 of them. On January 25, 2010, the Knesset passed a bill granting a general amnesty to around 400 of them, mostly teenagers. While most had by then finished serving their sentences, their criminal records were expunged. The people who were not pardoned as part of this amnesty had either been convicted of crimes that involved endangering human life, and involved the use of explosives or serious violence, or had a previous criminal record. A widespread opinion has it that Israel left Gazans with a generous endowment consisting of a rich infrastructure of greenhouses to assist their economic regrowth, and that this was immediately destroyed by the Palestinians. Two months prior to the withdrawal, half of the 21 settlements' greenhouses, spreading over 1,000 acres, had been dismantled by their owners, leaving the remainder on 500 acres, placing its business viability on a weak footing. International bodies, and pressure from James Wolfensohn, Middle East envoy of the Quartet, who gave $500,000 of his own money, offered incentives for the rest to be left to the Palestinians of Gaza. An agreement was reached with Israel under international law to destroy the settlers' houses and shift the rubble to Egypt. The disposal of asbestos presented a particular problem: some 60,000 truckloads of rubble required passage to Egypt. The remaining settlements' greenhouses were looted by Palestinians after the transfer for 2 days for irrigation pipes, water pumps, plastic sheeting and glass, but the greenhouses themselves remained structurally intact, until order was restored. Palestinian Authority security forces attempted to stop them, but did not have enough manpower to be effective. In some places, there was no security, while some Palestinian police officers joined the looters. The Palestine Economic Development Company (PED) invested $20,000,000 and by October the industry was back on its feet. Subsequently the harvest, intended for export via Israel for Europe, was essentially lost due to Israeli restrictions on the Karni crossing which "was closed more than not", leading to losses in excess of $120,000 per day. Economic consultants estimated that the closures cost the whole agricultural sector in Gaza $450,000 a day in lost revenue. 25 truckloads of produce per diem through that crossing were needed to render the project viable, but only rarely were just 3 truckloads able to obtain transit at the crossing, which however functioned only sporadically, with Israel citing security concerns. It appears that on both sides corruption prevailed, such as instances of Gazans negotiating with Israeli officers at the crossing and offering for bribes to get their trucks over the border. By early 2006, farmers, faced with the slowness of transit, were forced to dump most of their produce at the crossing where it was eaten by goats. Ariel Sharon fell ill, a new Israeli administration eventually came to power and Wolfensohn resigned his office, after suffering from obstacles placed in his way by the U.S. administration, which was sceptical of the agreements reached on border terminals. Wolfensohn attributed this a policy of hindrance to Elliott Abrams. Further complications arose arising from Hamas's election victory in January 2006, and the rift that emerged between Hamas and Fatah. He attributed the electoral success of Hamas to the frustration felt by Palestinians over the non-implementation of these agreements, which shattered their brief experience of normality. "Instead of hope, the Palestinians saw that they were put back in prison," he concluded. The project was shut down in April 2006 when money ran out to pay the agricultural workers. After Israel's withdrawal, the Palestinians were given control over the Gaza Strip, except for the borders, the airspace and the territorial waters. The area of the dismantled West Bank settlements remained part of Area C, (area under full Israeli civil and military control). On 23 September, hours after rockets were shot into Israel, a Hamas pickup truck in the Jabaliya Refugee camp was struck by a missile, killing 10 militants and injuring 85 people. On 26 September, Israel killed Palestinian Islamic Jihad commander Mohammad Khalil and his bodyguard with a missile strike; on 29 September Israel closed all Hamas charities on the West Bank, and as part of a five-day offensive fired artillery into the Gaza Strip. A British Parliamentary commission, summing up the situation eight months later, found that the Rafah crossing agreement worked efficiently, that from January–April 2006, the Karni crossing was closed 45% of the time, and severe limitations were in place on exports from Gaza, with, according to OCHA figures, only 1,500 of 8,500 tons of produce getting through; that they were informed most closures were unrelated to security issues in Gaza but either responses to violence in the West Bank or for no given reason. The promised transit of convoys between Gaza and the West Bank was not honoured; with Israel insisting that such convoys could only pass if they passed through a specially constructed tunnel or ditch, requiring a specific construction project in the future; Israel withdrew from implementation talks in December 2005 after a suicide bombing attack on Israelis in Netanya by a Palestinian from Kafr Rai. Under legislation passed by the Knesset, evacuated settlers were to be compensated for the loss of their homes, lands, and businesses. Originally, the law only allowed anyone age 21 or over who had lived in one of the evacuated settlements for over five consecutive years to be compensated, but the Israeli Supreme Court ruled that compensation for younger settlers should also be included in compensation payments to evacuated families. Settlers who lived in the area for at least two years were eligible for more money. The Israeli government offered bonuses to settlers who moved to the Galilee or Negev, and implemented a program in which settlers had the option to build their own homes, with the option of a rental grant. The Housing Ministry doubled the number of apartments available in the Negev. Farmers were offered farmland or plots of land on which to build a home, in exchange for reduced compensation. Land was to be compensated at a rate of $50,000 per dunam (approximately $202,000 per acre), with homes being compensated at a rate per square meter. Workers who lost their jobs were eligible for unemployment benefits ranging from minimum wage to twice the average salary, for up to six months. Workers aged 50 to 55 were offered years' worth of unemployment benefits, and those over 55 were eligible for a pension until age 67. A special category was created for communities that moved en masse, with the government funding the replacement of communal buildings. In cases where communities did not stay together and communal property was lost, individuals would receive compensation for donations made to those buildings. Taxes on compensation sums given to business owners were reduced from ten to five percent. The total cost of the compensation package as adopted by the Knesset was 3.8 billion NIS (approximately $870 million). Following an increase in the number of compensation claims after the disengagement, another 1.5 billion NIS (approximately $250 million) was added. In 2007, a further $125 million was added to the compensation budget. Approximately $176 million was to be paid directly to the evacuees, $66 million to private business owners, and the rest was allocated to finance the government's pullout-related expenses. Yitzhak Meron, the lawyer who represented the evacuees, in dealing with the government offices, recently (11.08.2014) described how this came about, as well as his perception of the situation. According to an Israeli committee of inquiry, the government failed to properly implement its compensation plans. By April 2006, only minimal compensation (approximately $10,000) had been paid to families to survive until they obtained new jobs, which was difficult for most people, considering that most of the newly unemployed were middle-aged and lost the agricultural resources that were their livelihood. Those seeking compensation also had to negotiate legal and bureaucratic hurdles. This criticism received further support from State Comptroller Micha Lindenstrauss's, report, which determined that the treatment of the evacuees was a "big failure" and pointed out many shortcomings. By 2007, 56.8% of evacuees had found jobs, 22.3% were unemployed and seeking work, and 31.2% of evacuees were unemployed and living off government benefits rather than seeking work. The average monthly salary among the evacuees was NIS 5,380 (about $1,281), a slight rise of 2.1 percent from the average salary the year before. This was, however, a sharp drop of 39% from the settlers' average monthly income before the disengagement. The average salary among evacuees was lower than the general average, as compared to above average before the disengagement. In addition to a drop in salary, the evacuees also suffered a drop in their standard of living due to the increased price of goods and services in their places of residence as compared to the settlements. Following the disengagement, settlers were temporarily relocated to hotels, sometimes for as long as half a year, before moving to mobile homes as temporary housing known as 'caravillas', before they could build proper homes. By June 2014, about 60% of evacuees were still living in these caravillas. Only 40% had moved to permanent housing, although construction of permanent settlements for the evacuees continues to progress. By July 2014, eleven towns for the evacuees had been completed with the expellees joining ten additional towns. Many of the permanent settlements under construction were given names reminiscent of the former Gaza settlements. By August 2014, unemployment among evacuees had dropped to 18%. In 2010 a bill was introduced in the Knesset providing a basic pension to business owners whose businesses collapsed. Following the withdrawal, Hamas was elected as the Palestinian government which started the chain reaction leading to Operation "Summer Rains" later within that year. In December 2006, news reports indicated that a number of Palestinians were leaving the Gaza Strip, due to political disorder and "economic pressure" there. In January 2007, fighting continued between Hamas and Fatah, without any progress towards resolution or reconciliation. Fighting spread to several points in the Gaza Strip with both factions attacking each other. In response to constant attacks by rocket fire from the Gaza Strip, Israel launched an airstrike which destroyed a building used by Hamas. In June 2007 the Fatah–Hamas conflict reached its height and Hamas took control over the Gaza Strip. In August 2008, a museum of Gush Katif opened in Jerusalem near Machane Yehuda. Yankeleh Klein, the museum director, sees it as an artistic commemoration of the expulsion from the 21 Gaza settlements, and the evacuees' longing to return. The art displayed in the museum is that of Gaza evacuees along with pieces by photographers and artists who were involved in the disengagement or were affected by it. In the newly renovated Katif Center, more properly called the "Gush Katif Heritage Center in Nitzan," Israel, they combine modern technology with guided tours by Gush Katif expellees to provide a very emotional experience. Project Coordinator Laurence Beziz notes that. "Our goal is to tell the story of 35 years of pioneering the land of Israel in Gush Katif and to allow an insight as to what life was in Gush Katif." The unilateral disengagement plan has been criticized from various viewpoints. In Israel, it has been criticized by the settlers themselves, supported by the Israeli right, who saw Ariel Sharon's action as a betrayal of his previous policies of support of settlement. Conversely, the disengagement has been criticized by parts of the Israeli left, who viewed it as nothing more than a mode of stalling negotiations and increasing Israeli presence in the West Bank. The disengagement also did not address wider issues of occupation. Israel retained control over Gaza’s borders, airspace, coastline, infrastructure, power, import-exports, etc. Within Israel, disengagement has been criticized heavily, both for its very execution, and for the manner in which it was carried out. From the very beginning, Sharon was accused of hijacking the mandate he received for a cause for which he had not been elected. In 2003, Sharon was elected over Labor Party chairman, Amram Mitzna. Mitzna ran on a platform that included a separation plan very similar to Sharon's Disengagement Plan. Sharon ran with an opposing platform, rejecting the idea of unilateral separation from the West Bank and the Gaza Strip. At a certain point, Sharon even declared that Netzarim's fate was the same as Tel Aviv's. In the cabinet's initial June vote over the plan Benjamin Netanyahu, then Finance Minister, announced he would vote in favor of the plan only if Sharon promised to hold a national referendum to decide the fate of the Gaza Strip and the northern West Bank. Such a referendum was never held, in spite of Sharon's commitment. Druze MK Ayoob Kara (Likud) strongly opposed the plan, saying it will be "terrible for Israeli security." Kara warned that Hamas would take over the Gaza Strip and use it as a base from which to attack Israel. Some Israelis believe that the disengagement's aftermath is a disgrace. This view holds that Sharon was in such a rush to execute his plan that he did not plan accordingly for the residents that were evicted. Most of the former settlers were housed in hotels and guesthouses for the first few months, being threatened with further eviction numerous times. People were still residing in hotel rooms right up until Passover (in April) of 2006, more than eight months after losing their homes. The Disengagement Plan was also criticized by both Israelis and other observers from the opposite viewpoint as an attempt to make permanent the different settlements of the West Bank, while the Gaza strip was rendered to the Palestinian National Authority as an economically uninteresting territory with a Muslim population of nearly 1.4 million, seen as a "threat" to the Jewish identity of the Israeli democratic state. As Leila Shahid, speaker of the PNA in Europe declared, the sole fact of carrying out the plan unilaterally already showed that the plan was only thought of according to the objectives of Israel as viewed by Sharon. Brian Cowen, Irish Foreign Minister and speaker of the European Union (EU), announced the EU's disapproval of the plan's limited scope in that it did not address withdrawal from the entire West Bank. He said that the EU "will not recognize any change to the pre-1967 borders other than those arrived at by agreement between the parties." However, Europe has given tentative backing to the Disengagement plan as part of the road map for peace. Critics pointed out that, at the same time that Sharon was preparing the withdrawal, he was favoring settlements in the West Bank, among them Ma'ale Adumim, the largest Israeli settlement near Jerusalem. According to Peace Now, the number of settlers increased by 6,100 compared with 2004, to reach 250,000 in the West Bank. In an October 6, 2004, interview with Haaretz, Dov Weissglass, Sharon's chief of staff, declared: "The significance of the disengagement plan is the freezing of the peace process.... When you freeze that process, you prevent the establishment of a Palestinian state and you prevent a discussion on the refugees, the borders and Jerusalem. Disengagement supplies the amount of formaldehyde that is necessary so there will not be a political process with the Palestinians." I strongly support [Prime Minister Sharon's] courageous initiative to disengage from Gaza and part of the West Bank. The Prime Minister is willing to coordinate the implementation of the disengagement plan with the Palestinians. I urge the Palestinian leadership to accept his offer. By working together, Israelis and Palestinians can lay the groundwork for a peaceful transition. As part of a final peace settlement, Israel must have secure and recognized borders, which should emerge from negotiations between the parties in accordance with UNSC Resolutions 242 and 338. In light of new realities on the ground, including already existing major Israeli population centers, it is unrealistic that the outcome of final status negotiations will be a full and complete return to the armistice lines of 1949. I welcome the Israeli Prime Minister's proposals for disengagement from Gaza. This represents an opportunity to restart the implementation of the Road Map, as endorsed by the UN Security Council. The Irish Minister for Foreign Affairs, Brian Cowen (Ireland having Presidency of the EU at the time), announced the European Union's disapproval of the plan's limited scope in that it does not address withdrawal from the entire West Bank. He said that the EU "will not recognize any change to the pre-1967 borders other than those arrived at by agreement between the parties." However, Europe has given tentative backing to the Disengagement Plan as part of the road map for peace. Kofi Annan, United Nations Secretary-General, commended on August 18, 2005 what he called Israeli Prime Minister Sharon’s "courageous decision" to carry through with the painful process of disengagement, expressed the hope that "both Palestinians and Israelis will exercise restraint in this challenging period", and "believes that a successful disengagement should be the first step towards a resumption of the peace process, in accordance with the Road Map", referring to the plan sponsored by the diplomatic Quartet – UN, EU, Russia, and the United States – which calls for a series of parallel steps leading to two states living side-by-side in peace by the end of the year. The PA, in the absence of a final peace settlement, has welcomed any military withdrawal from the territories, but many Palestinian Arabs have objected to the plan, stating that it aims to "bypass" past international agreements, and instead call for a complete withdrawal from the West Bank and Gaza Strip. Their suspicions were further aroused when top Sharon aide Dov Weisglass was quoted in an interview with Israeli newspaper Haaretz on October 6, 2004, as saying that the disengagement would prevent a Palestinian state for years to come (see above). This incident has bolstered the position of critics of the plan that Sharon is intentionally trying to scuttle the peace process. Israeli officials, including Weisglass, denied this accusation, and media critics have asserted that the Weisglass interview was widely distorted and taken out of context. On August 8, 2005, Haaretz quoted a top Palestinian Authority religious cleric, Sheikh Jamal al-Bawatna, the mufti of the Ramallah district, in a fatwa (a religious edict) banning shooting attacks against Israeli security forces and settlements, out of concern they might lead to a postponement of the pullout. According to Haaretz, this is the first time that a Muslim cleric has forbidden shooting at Israeli forces. On August 15, 2005, scenes of delight took place across the Arab world, following the long-ingrained suspicion that the disengagement would not take place. 69% supported a general referendum to decide on the plan; 26% thought that approval in the Knesset would be enough. If a referendum were to be held, 58% would vote for the disengagement plan, while 29% would vote against it. Polls on support for the plan have consistently shown support for the plan in the 50-60% range, and opposition in the 30-40% range. A June 9, 2005, Dahaf Institute/Yedioth Ahronoth poll showed support for the plan at 53%, and opposition at 38%. A June 17, telephone poll published in Maariv showed 54% of Israel’s Jews supporting the plan. A poll carried out by the Midgam polling company, on June 29 found support at 48% and opposition at 41%, but a Dahaf Institute/Yedioth Ahronot poll of the same day found support at 62% and opposition at 31%. A poll conducted the week of July 17 by the Tel Aviv University Institute for Media, Society, and Politics shows that Israeli approval of the disengagement is at 48%; 43% of the respondents believe that Palestinian terrorism will increase following disengagement, versus 25% who believe that terrorism will decline. On July 25, 2004, the "Human Chain", a rally of tens of thousands of Israelis to protest against the plan and for a national referendum took place. The protestors formed a human chain from Nisanit (later moved to Erez crossing because of security concerns) in the Gaza Strip to the Western Wall in Jerusalem a distance of 90 km. On October 14, 2004, 100,000 Israelis marched in cities throughout Israel to protest the plan under the slogan "100 cities support Gush Katif and Samaria". On June 9, 2005, a poll on Israeli Channel 2 showed that public support for the plan had fallen below 50 percent for the first time. On July 18, 2005, a nonviolent protest was held. The protest began in Netivot near Gaza. The protest march ended July 21 after police prevented protesters from continuing to Gush Katif. On August 2, 2005, another protest against disengagement began in Sderot, with approximately 50,000 attendees. On August 10, 2005, in response to calls from Jewish religious leaders, including former Chief Rabbis Avraham Shapira, Ovadia Yosef, and Mordechai Eliyahu, between 70,000 (police estimate) and 250,000 (organizers' estimate) Jews gathered for a rally centered at the Western Wall in prayer to ask that the planned disengagement be cancelled. The crowds that showed up for the rally overwhelmed the Western Wall's capacity and extended as far as the rest of the Old City and surrounding Jerusalem neighborhoods. The prayer rally was the largest of its kind for over 15 years, since the opposition to the Madrid Conference of 1991. 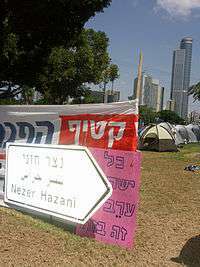 On August 11, 2005, between 150,000 (police estimates) and 300,000 (organizers' estimates) people massed in and around Tel Aviv's Rabin Square for an anti-disengagement rally. Organizers called the event "the largest expression of public protest ever held in Israel." According to a police spokesman, it was one of the largest rallies in recent memory. A widely publicized weeklong show of support for the disengagement attracted only tens of supporters. The supporters drove in a caravan through Israel, ending in Jerusalem. According to the organizer, there were at most seventy cars involved. The religious approach maintains that Eretz Israel was promised to the Jews by God, and that no government has the authority to waive this inalienable right. In their view, inhabiting all of the land of Israel is one of the most important mitzvot. The political approach, owing much to existing right-wing ideology, claims that the areas to be evacuated constitute Israeli territory as legitimately as Tel Aviv or Haifa, and that relocating settlers is illegal and violates their human rights. Some have gone as far as labelling it a war crime. In the wake of the Sharm el-Sheikh Summit of February 2005, some have claimed that now that there is a negotiation partner on the Palestinian side, the plan has become redundant. The military approach says that the plan is disastrous to Israeli security — not only will prevention of Qassam rockets and other attacks from Gaza become nearly impossible after the withdrawal, but implementation of the plan will be an important moral victory for Hamas and other organizations, and will encourage them to continue executing terrorist attacks against Israel. Orange ribbons in Israel symbolize opposition to the disengagement; it is the color of the flag of the Gaza coast Regional Council. Blue ribbons (sometimes blue-and-white ribbons) symbolized support for the disengagement and are intended to invoke the Israeli flag. Polls in the U.S. about the question of the Gaza pullout produced varied results. One poll commissioned by the Anti-Defamation League, and conducted by the Marttila Communications Group from June 19–23, 2005 among 2200 American adults, found that 71% of respondents felt that the Disengagement Plan is closer to a "bold step that would advance the Peace Process" than to a "capitulation to terrorist violence", while 12% felt that the plan is more of a "capitulation" than a "bold step". Another poll commissioned by the Zionist Organization of America, and conducted by McLaughlin & Associates on June 26, 2005 – June 27, 2005, with a sample of 1,000 American adults, showed U.S. opposition to the proposed disengagement. Respondents, by a margin of 4 to 1 (63% to 16%) opposed "Israel’s unilateral withdrawal from a section of Gaza and northern Samaria and forcing 10,000 Israeli Jews from their homes and businesses" and by a margin of 2.5 to 1 (53% to 21%), agreed with the statement that "this Gaza Plan sends a message that Arab terrorism is being rewarded." Morton Klein, President of the Zionist Organization of America, criticized the Anti-Defamation League-commissioned poll, stating that the question in the poll was not whether or not respondents agreed with the Disengagement Plan, but was a subjective characterization of primary motives behind it: whether Israeli politicians are acting more for the sake of capitulating to terrorism or for the sake of continuing the road map. The Anti-Defamation League, in turn, criticized the ZOA-commissioned poll, calling its wording "loaded." "The discrepancy between the relatively calm reality emerging from most stories and the overall picture reflected in the headlines is evident in every aspect of the disengagement story: in the suppression of information about the voluntary collection of weapons held by the settlers in the Gaza Strip; in reporting exaggerated numbers of right-wing protesters who infiltrated the Strip before the evacuation; in misrepresentation of the purpose of settler protest (which was an exercise in public relations, not a true attempt to thwart the disengagement plan); and in playing down coordinated efforts between the Israeli security forces and the settlers." The price for this misrepresentation was paid, at least in part, by the settlers, whose public image was radicalized unjustifiably. After the disengagement was completed without violence between Israelis and a sense of unity and pride pervaded society, "the media chose to give Israeli society, and especially its security forces, a pat on the back." In March 2006, Avi Dichter suggested that a Kadima-led government, if elected, would seek to retain control over Kiryat Arba, the Jewish areas of Hebron, the Ofra bloc, and the Jordan Valley in addition to the main settlement blocs. The exact lines, he said, would be drawn by the government in consultation with coalition partners and settler leaders, but without input from the Palestinian side. The specific settlements he mentioned would be evacuated were Elon Moreh, Yitzhar, and Itamar around Nablus; Shilo on the central mountain ridge; Psagot overlooking Ramallah; Tekoa and Nokdim in the Judean Desert southeast of Bethlehem; and Pene Hever, Ma'on and Otniel south of Hebron. After the 2006 Lebanon War, Olmert announced to his cabinet that disengagement from the West Bank was no longer a high priority. In September 2006, Shimon Peres suggested to Tony Blair that Hermesh and Mevo Dotan could be evacuated. ↑ "Jewish Settlers Receive Hundreds of Thousands in Compensation for Leaving Gaza". Democracy Now. 16 August 2005. Retrieved 2007-05-05. ↑ "Demolition of Gaza Homes Completed". Ynetnews.com. 1 September 2005. Retrieved 2007-05-05. ↑ Rivlin, Paul (2010). The Israeli Economy from the Foundation of the State through the 21st Century. Cambridge University Press. p. 245. ISBN 9781139493963. ↑ Peters, Joel (2012). "Gaza". In Caplan, Richard. Exit Strategies and State Building. New York: Oxford University Press. p. 234. ISBN 9780199760114. ↑ "6 years after stroke ariel sharon still responsive son says". The New York Times. ↑ Steven Poole (2006). Unspeak: How Words Become Weapons, How Weapons Become a Message, and How That Message Becomes Reality. Grove Press. p. 87. ISBN 0-8021-1825-9. ↑ Ari Shavit (2004). "Top PM aide: Gaza plan aims to freeze the peace process". Haaretz. ↑ "WashingtonTimes.com". WashingtonTimes.com. Retrieved 2013-01-20. ↑ "BBC.co.uk". BBC News. 2005-03-28. Retrieved 2013-01-20. 1 2 Foreign Policy Aspects of the War Against Terrorism: Fourth Report of Sesson, 2005-2006, Great Britain: Parliament: House of Commons: Foreign Affairs Committee, The Stationery Office, 2006 pp.71-84, pp.78f. ↑ "Paul McCann: The world's largest prison camp - Commentators - Voices - The Independent". comment.independent.co.uk. Retrieved 2015-07-23. ↑ "HRW.org". HRW.org. 2004-10-29. Retrieved 2013-01-20. ↑ IHLresarch.org Archived July 26, 2007, at the Wayback Machine. ↑ "The Times Online". London: The Times Online. Retrieved 2013-01-20. ↑ "TimesOnline.co.uk". London: TimesOnline.co.uk. 2012-03-13. Retrieved 2013-01-20. ↑ "Forces storm militant settler's home - Israel News, Ynetnews". Ynetnews.com. 1995-06-20. Retrieved 2013-01-20. ↑ Conal Urquhart in Tel Aviv (2005-08-19). "Guardian.co.uk". London: Guardian. Retrieved 2013-01-20. ↑ Thomson Reuters Foundation. "Thomson Reuters Foundation | News, Information and Connections for Action". alertnet.org. Retrieved 2015-07-23. 1 2 3 4 Thomas G. Mitchell, Israel/Palestine and the Politics of a Two-State Solution, McFarland 2013 p.78. ↑ "Demolition of Gaza homes completed - Israel News, Ynetnews". Ynetnews.com. 1995-06-20. Retrieved 2013-01-20. 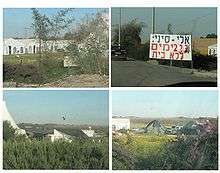 ↑ "IDF Begins Task of Relocating Gush Katif Graves - Politics & Gov't - News". Israel National News. 2005-08-28. Retrieved 2013-01-20. ↑ "Cemetery Relocation Complicates Gaza Plan". Fox News. November 30, 2011. ↑ Harel, Amos (2005-09-07). "Haaretz.com". Haaretz.com. Retrieved 2013-01-20. ↑ "IMRA.org". IMRA.org. 2005-09-10. Retrieved 2013-01-20. ↑ "CNN.com". Edition.cnn.com. Retrieved 2013-01-20. ↑ "BBC.co.uk". BBC News. 2005-09-12. Retrieved 2013-01-20. ↑ "Dozen Palestinians killed in West Bank, Gaza". CNN. October 4, 2004. 1 2 Erlanger, Steven (July 15, 2005). "Israeli Settlers Demolish Greenhouses and Gaza Jobs". The New York Times. ↑ "UN field report". Gazasy.blogspot.com. 2005-09-20. Retrieved 2013-01-20. ↑ "BBC report". BBC News. 2005-09-21. Retrieved 2013-01-20. ↑ Lis, Jonathan (2010-01-25). "Israel to expunge criminal records of 400 Gaza pullout opponents - Israel News | Haaretz Daily Newspaper". Haaretz.com. Retrieved 2013-01-20. ↑ "Shalom slams 'barbaric act' - Israel News, Ynetnews". Ynetnews.com. 1995-06-20. Retrieved 2013-01-20. ↑ "articles/0,7340,L-314220,00". ynetnews.com. Retrieved 2015-07-23. ↑ Mitchell G. Bard (2005-09-12). "Myth and Fact: Protecting Jewish Holy Sites". Jewishfederations.org. Retrieved 2013-01-20. ↑ "Technology Startup Companies In Israel". haaretzdaily.com. Retrieved 2015-07-23. ↑ Jpost.com Archived October 5, 2012, at the Wayback Machine. 1 2 3 4 5 6 Justin Schwegel, 'The Greenhouse propaganda—How Gazan history is being rewritten to dehumanize Palestinians,' Mondoweiss 10 August 2014. 1 2 3 Shahar Smooha, All the dreams we had are now gone', Haaretz 19 July 2007. 1 2 " Advertisement". haaretz.com. Retrieved 2015-07-23. ↑ "Looters strip Gaza greenhouses - World news - Mideast/N. Africa | NBC News". MSNBC. 2005-09-13. Retrieved 2013-01-20. ↑ Wolfensohn, J.D. (2010). A Global Life: My Journey Among Rich and Poor, from Sydney to Wall Street to the World Bank. PublicAffairs. ISBN 9781586489939. Retrieved 2015-07-23. ↑ Raanan Ben-Zur, where 5 Israelis were killed '5 killed in Netanya bombing ,' Ynet 5 December 2005. ↑ Dromi, Shai M. (2014). "Uneasy Settlements: Reparation Politics and the Meanings of Money in the Israeli Withdrawal from Gaza". Sociological Inquiry. 84 (1). doi:10.1111/soin.12028. ↑ "Only half of Gaza evacuees working - Israel Business, Ynetnews". Ynetnews.com. 1995-06-20. Retrieved 2013-01-20. 1 2 "Communities". gushkatif.co.il. Retrieved 2015-07-23. ↑ "Compensation for Jews Who Lost Homes in Disengagement". Jewishvirtuallibrary.org. Retrieved 2013-01-20. ↑ Lis, Jonathan (2010-06-23). "New compensation bill for Gaza settlers passes first Knesset reading Israel News | Haaretz Daily Newspaper". Haaretz.com. Retrieved 2013-01-20. ↑ "Former Gaza settlers still stuck in temporary mobile homes (Feature)". Monsters and Critics. 2010-08-12. Retrieved 2013-01-20. ↑ SFgate.com, More Palestinians flee homelands, Sarah El Deeb, Associated Press, December 9, 2006. JPost.com, Hamas, Fatah continue clashes; 8 killed, Jpost.com 1/3/07. Excite.com, Cease-Fire Starts Taking Hold in Gaza, Ibrahim Barzak, 1/30/07, Associated Press. Yahoo.com Archived February 6, 2007, at the Wayback Machine., Hamas attacks convoy, Associated Press, 2/1/07. Yahoo.com;, Hamas kills 8 in Gaza border clash, By Ibrahim Barzak, Associated Press Writer, 5/15/07. BBC.co.uk, Resignation deepens Gaza crisis BBC, 5/14/07. Archived May 11, 2011, at the Wayback Machine. ↑ Yahoo.com Archived June 9, 2007, at the Wayback Machine., Israel attacks in Gaza amid factional violence, by Nidal al-Mughrabi, Associated Press, 5/16/07. ↑ Yahoo.com Archived May 18, 2007, at the Wayback Machine., Gaza bloodshed alarms West's Arab allies by Hala Boncompagni, Associated Press, 5/16/07. ↑ Jpost.com, Jerusalem Post article on the new Gush Katif museum. Archived August 7, 2012, at the Wayback Machine. ↑ "Esra Magazine - Whatever happened to Gush Katif?". esra-magazine.com. Retrieved 2015-07-23. ↑ Gaza withdrawal 'victory for terrorism'. World Net Daily, 13 April 2005. ↑ "Israel: Sharon the blessed". Le Monde Diplomatique. February 2006. ↑ "Archives.gov". Georgewbush-whitehouse.archives.gov. Retrieved 2013-01-20. ↑ "Archives.org". Georgewbush-whitehouse.archives.gov. Retrieved 2013-01-20. ↑ "UN.org". UN.org. 2005-08-18. Retrieved 2013-01-20. ↑ "UN.org". UN.org. 2005-08-24. Retrieved 2013-01-20. ↑ "W3ar.com". W3ar.com. Retrieved 2013-01-20. ↑ Regular, Arnon (2005-08-08). "Haaretz.com". Haaretz.com. Retrieved 2013-01-20. ↑ "Palestinians celebrate as they watch the removal trucks go by - Middle East - World - The Independent". news.independent.co.uk. Retrieved 2015-07-23. ↑ "NRG.co.il". NRG.co.il. 2004-09-15. Retrieved 2013-01-20. ↑ "Yahoo.com". Story.news.yahoo.com. Retrieved 2013-01-20. 1 2 Angus-Reid.com Archived August 21, 2007, at the Wayback Machine. ↑ Arutzsheva.com Archived December 12, 2005, at the Wayback Machine. ↑ "IMRA.org". IMRA.org. 2005-07-20. Retrieved 2013-01-20. ↑ "Walla.co.il". News.walla.co.il. Retrieved 2013-01-20. ↑ IsraelReporter.com Archived March 29, 2006, at the Wayback Machine. ↑ " Advertisement". haaretz.com. Retrieved 2015-07-23. ↑ Jpost.com Archived August 7, 2012, at the Wayback Machine. ↑ "Ynetnews.com". Ynetnews.com. 1995-06-20. Retrieved 2013-01-20. ↑ Keshev.org Archived June 28, 2009, at the Wayback Machine. ↑ Keshev.org Archived November 28, 2007, at the Wayback Machine. 1 2 3 Disconnected: The Israeli Media's Coverage of the Gaza Disengagement, Keshev, January 2006 Archived July 21, 2011, at the Wayback Machine. ↑ Keshev.org Archived July 21, 2011, at the Wayback Machine. Wikimedia Commons has media related to Israel's unilateral disengagement plan. Israel's Disengagement Plan: Renewing the Peace Process Official website from the Israel Ministry of Foreign affairs. Jan 2005.htm Israel's Disengagement Plan: Selected Documents Official website from the Israel Ministry of Foreign affairs. Right Strategy Again; Gaza pullout will turn terror morass to conventional standoff by Victor Davis Hanson, August 29, 2005. Nov Operation "Pillar of Defense"